From My Front Porch: What Are The Odds? Not true mathmatical odds - numbers aren't my thing they are Chris' and of course he helped me with this because he can remember statistics, they just make my eyes glaze over. He and I take turns "freaking out" - when he is stressing I am very care-free and when I am stressing he is very calm. So the other day when I was having my turn of "freaking out" Chris started listing the start/finish dates of our planting over the last 20 years and telling me "No worries - it all gets done just not always exactly when you want"! What we determined was that it is about 50/50. 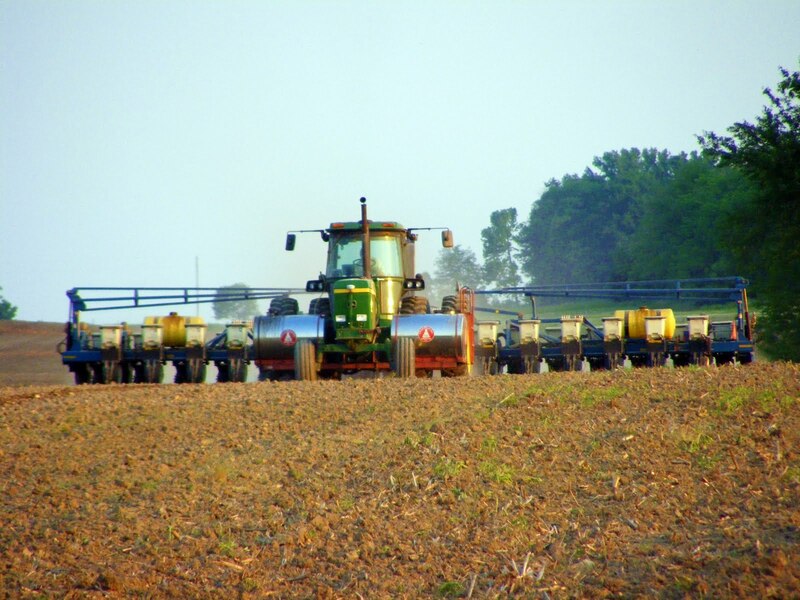 Idealy we would like to start planting corn about April 20th, and finish by May 10, and finish beans in May. June 1 is our day for determining we are "late". Every year is different, last year we started on April 13, which was a amazingly early for us, but the forecast was for warm weather, near 80, for a few days. By April 22 we had planted 80% of our corn, and had all our spraying done. This year, we have done nothing, except dump the rain gauge - considering whether or not this needs to be a full time job for someone. Had a friend tell us in '98 that he had quit dumping out his rain gauge it just got to be too much work! We have planted corn as late as June 18, and replanted corn on June 24. We used to expect a late year every now and then, but recently, we have had as many challenging years as good ones. We were late in 1995, 1996, 1998, 2002, 2008, 2009, and now it looks as if we will be late in 2011. A friend mentioned the other day, if I don't plant in April, I surely plant in June. That is 7 years in 17. Many people here still talk about how bad 1981 was. 1996 we abandonded half our intended corn acres, switching those acres to beans, which handle late conditions better. In 98 we planted beans in July, on several acres. 2008 was the flood, though in 2009 and 2010, we measured as much rain between April 1 and July 15, over 30", just spaced out better. *Pollination is pushed into the hotter part of the summer. *Late planted crops face more drought risk. *weeds take over the field and complicate planting. As I type it is still raining and predicted to rain most of this week - at least 1-3 more inches according to Chuck this morning! All can't be lost - Chris is on his way to pick up some new gilts! Not sure what the schedule is this week as far as what days I will be "freaking out" and depressed but I feel truly lucky that I have someone to share the burden with, a warm house to "freak out" in, and 3 great kids that constantly make me smile. Dad is in (because of this same wet weather)and read your blog. He, as Chris is, loves the details and history of farming. You have heard his theory about in all his years there has never been a crop not planted (we are not going to talk about how good the harvest is at the end of the cycle!). However, we all know they are uneasy when the rain continues to come down. Interesting number. I know the Boy's family is getting very antsy, however I am sure it will all work out in the end! We are doing the same number crunching up here, but we have been missing these last few rains that you all in the southern part of the state are still getting. MAYBE we can start spraying some of the drier fields in a day or two then see where we are. Our official NERVOUS dance starts May 10.